Summersville Lake is a reservoir located in the US state of West Virginia. The lake is formed by a rock-fill dam (Summersville Dam) on the Gauley River, south of Summersville in Nicholas County. 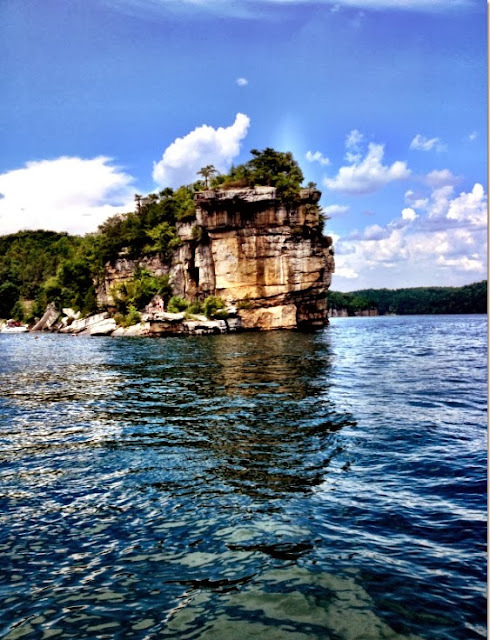 It is the largest lake in West Virginia, with 2,700 acres (1,100 ha) of water and over 60 miles (97 km) of shoreline at the summer pool water level. The lake was constructed between 1960 and 1966 by the United States Army Corps of Engineers in order to control flooding in an 803-square-mile (2,080 km2) watershed along the Gauley River and theKanawha River. At 390 feet (120 m) tall, 2,280 feet (690 m) long, and containing 12,000,000 cubic yards (9,200,000 m3) of dirt and rock, the dam itself is the second-largest rock-fill dam in the Eastern United States. President Lyndon B. Johnson dedicated both the dam and a new Summersville Post Office on September 3, 1966. The US Corps of Engineers broke a long-standing tradition in naming what was called the Summersville Project. Tradition holds that the project will be named after the town nearest the site of construction, unless named for a person (such as Hoover Dam). However, the town of Summersville was not the one nearest the dam. The village of Gad (located near the present-day marina) was literally flooded at the opening of the reservoir. After briefly considering the name "Gad Dam," it was instead decided to name the project after the next nearest town – Summersville. Тема „Ефирно“. Изображенията в темата са от Ailime. Предоставено от Blogger.